This is a blog about my interest in Green Energy (in particular, wind and solar energy), our future! I've been reading a lot about China's wind energy lately. Articles like "Great leap forward for China's wind energy", "Why China is getting wind energy right", made me want to take a look at China's wind energy a bit closer. Although china was on the bottom end of the wind energy race about five years ago, today China is the second largest producer of wind power after United States. 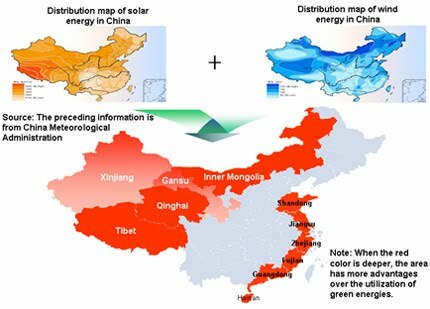 At the end of 2009, China accounted for about 25.1 Giga Watts (Source). Thats more than Three Gorges Dam (capacity: 22.5 GW). 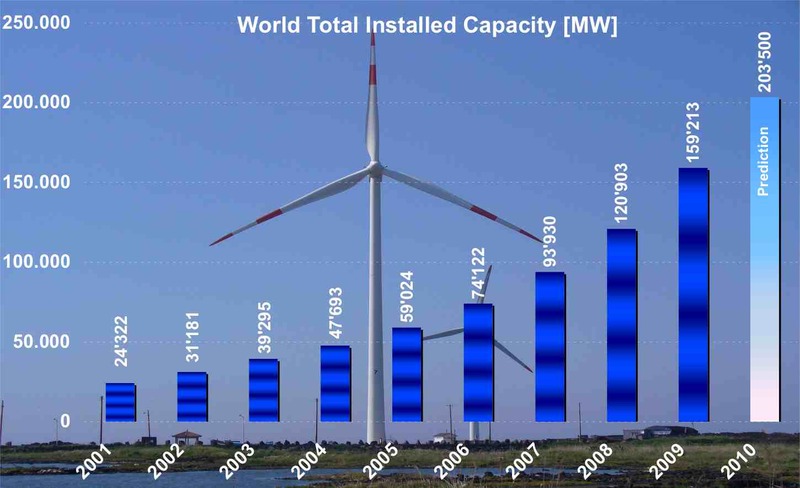 In 2009, the Asia giant, installed more wind turbines than all of Europe combined. Fascinating figures from Global Wind Energy Council (GWEC) indicated that China installed 13 gigawatts of new wind power capacity, compared to 10 GW in Europe and 9.9 GW in the United States. No doubt that China will surpass U.S. and lead this race in wind energy by the end of this year. Before we jump into China, lets look at just the basics of HOW wind energy works. So here is a neat little animation video of how it works. Pictures speak a thousand words. In the map above, you can see where all the major wind energy companies have installed huge wind farms all across the country. The big players like Goldwind, Vestas, GE Wind, Gamesa, and Suzlon are betting on wind power. Without a doubt, it is showing a promising future in China. Wind power showed a growth rate of 31.7 %, the highest rate since 2001. The wind sector in 2009 had a turnover of 50 billion €. The wind sector employed 550,000 people worldwide. In the year 2012, the wind industry is expected for the first time to offer 1 million jobs. Asia accounted for the largest share of new installations (40.4 %), followed by North America (28.4 %) and Europe fell back to the third place (27.3 %). My opinion: Can China move forward with wind? They certainly can, and they will. But they are going to have to import foreign help, and they already have begun to do so. Denmarks's Vestas will open it's fifth factory in China this year, and according to the China Wind and Energy Association (CWEA), General Electric and A-Power have already signed letters of intent to provide 900 wind turbine gearboxes and establish a joint venture to build a wind turbine assembly facility. 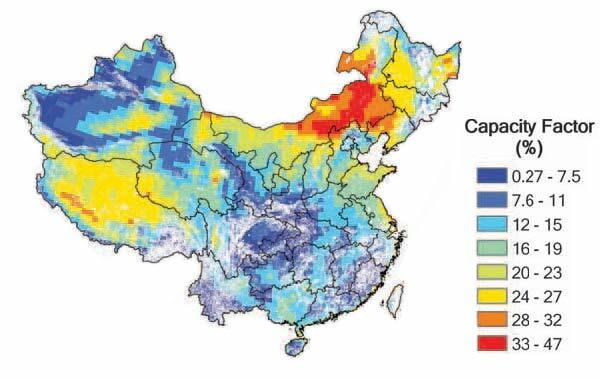 China, being the most populated country and being the most polluted countries in the world (followed by U.S.), has no choice but to move where the wind blows. For China, it is critical because safe and sustainable development cannot be attained without cleaning up its act. 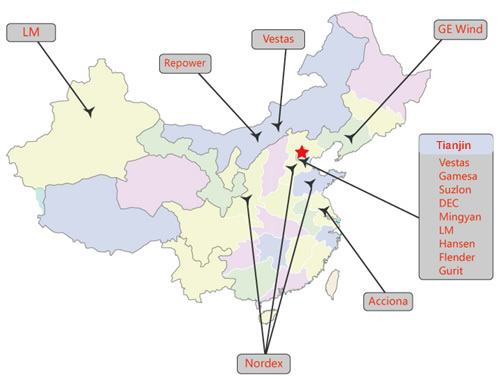 Major companies like Goldwind Science and Technology, Sinovel Windtec Co, Gamesa Corporacion Tecnologica, Vestas Wind Systems, Dongfang Electric Corporation, GE Energy, and Suzlon Energy Limited are investing huge amounts of capital on Wind Power in China. I think that China will be leading the wind energy race next year. What do you think? Interesting fact: A report release by state media in 2007 estimated that the average life expectancy of Chinese city traffic police is 43 years of age. The primary cause being air pollution. There is evidence that wind energy was used to propel boats along the Nile as early as 5000BC. The earliest known windmills were in Persia (Iran) and looked like large paddle wheels. In 200BC people in China and the Middle East used windmills to pump water and grind grain. The largest wind turbine in the world is in Hawaii. It stands 20 stories high and has rotors the length of a football field. Wind is the fastest growing energy source worldwide. An average wind speed of 14mph is required to convert wind energy into electricity. Ever wanted to be inside a wind turbine? There's a chance you are qualified for a new government sponsored solar program. Click here to find out if you are eligble now! Did you get your pollution today? I've always had a passion for green energy in particular solar energy. My experience ever since undergraduate has been with solar cells, solar design. solar power generation, transmission and distribution. All the projects i've ever done has involved solar energy. I have completed my Masters degree in Engineering Physics with specialization in solar energy. I have worked as an Electrical Engineer at NASA for two years. This gave me a great experience in working with cutting edge technology. I have a strong background in the principles and practices of electrical power systems, engineering design, and construction. I believe that passion determines how much impact you can have on anything you do and I'm very passionate about solar energy. I want to contribute my skills to create an awareness among the general public about solar energy and how we can utilize it in our everyday life. I was born in India, grew up in Detroit, Michigan since i was a kid and now live in Houston, Texas.